Amazing, aren't they? 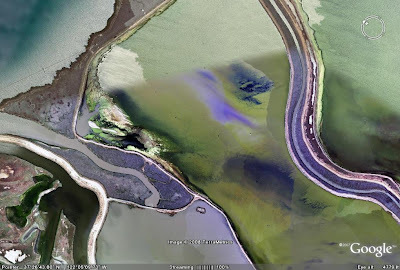 These are salt ponds used to make salt from sea water. The color is because of the different types of photosynthetic bacteria, algae and other sea creatures that grow in them. Colors range from green to orange to deep red. Colors change based on the salinity of the water as different life forms thrive at different levels of salinity. With low to mild salinity, green algae make it appear greenish. 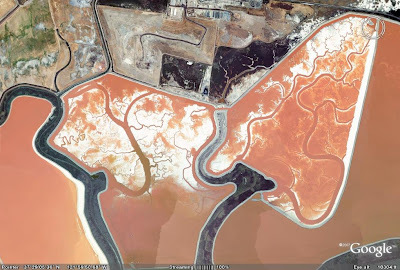 The orange tint is from millions of small brine shrimp that thrive in medium salinity water. At mid to high salinity, Dunaliella algae and halophilic (salt loving) bacteria make the water appear red. 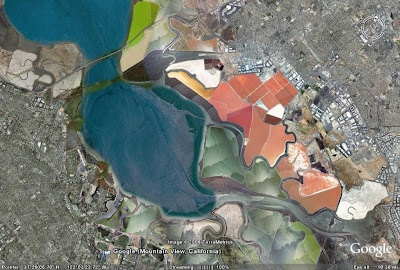 These satellite pictures from Google earth do not the kind of clarity you would get while flying over them at lower heights. They are a delightful sight to watch on flights to San Francisco. The colors dilute and sometimes disappear when it rains heavily in these parts as the water gets diluted. So next time you are flying over San Francisco, watch out for these beauties! 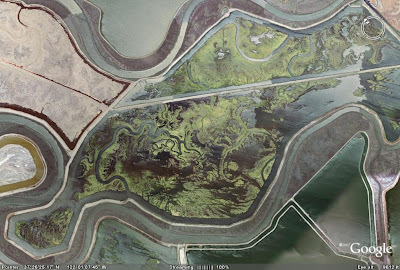 Download the KML file here and see these places in Google Earth. Nice. I should check these out soon if possible. @Floating Clouds, @Kirklops, @shveta Thanks.